A WORTHY CAUSE: The A New Day project is a campaign that serves two purposes; with one being a way to show pride and support for our newly elected historic first African American President the other is a much needed avenue to raise working capital and revenue to cover the operating cost and expense of operating recreation/gymnasium centers for our inner city teens and youth. Our youth and President need your support today. 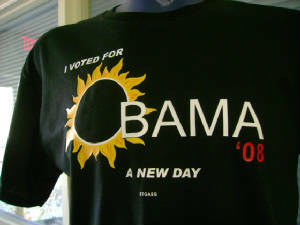 Purchase your Barack Obama, “A New Day” T-shirt today and support both our President and our Youth. Be a part of America’s history and future. Circle Size: S. M. L. XL. 2X. 3X.